by Dave from The Longest Way Home ~ May 31st, 2012. Updated on July 16th, 2018. Published in: Travel blog » Food around the world » Nepali food. Ask many a tourist what their favourite food in Nepal is and there’s a strong chance they’ll reply “Momos!” There’s a good reason for this. Momos in Nepal are delicious! There’s also a substantial difference in tourist or upper scale momos and locally made momos in Nepal. I’ll cover real locally made momos later, for now this type of momo is commonly found in tourist restaurants and in mid scale Nepalese cafes. A momo is made from thin flour pastry with a filling inside. It’s essentially a little dumpling. 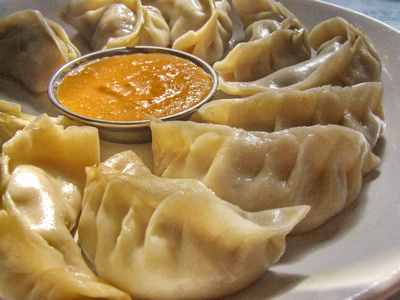 Momos are found in Nepal and Tibet. There are many other variations around the world though from India and China all the way to Europe. 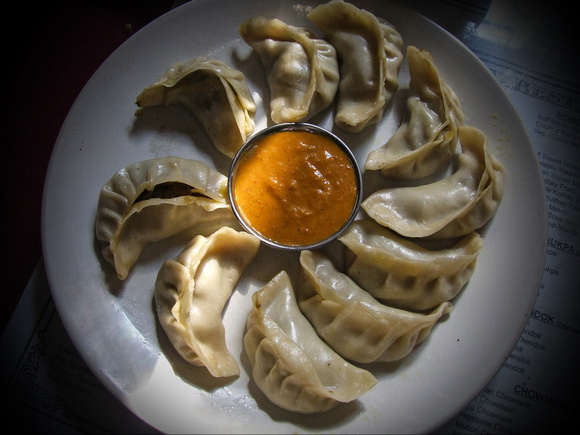 But in Nepal the momo does have some unique attributes and variations worth mentioning. What types of momo are there? The most common types of momo are the steamed kind. There’s also a popular fried momo. Momos are often severed with a dip. In this case it’s a light masala dip. The best place to find momos in Nepal is where ever they are freshly cooking them. The worst place is some side cafe that has them sitting there all day in a low-grade electric steamer. Many locals will have their favorite place to get momos and will tell you to avoid other places. Saying things like the chicken momos from a certain restaurant are made from claws, beaks and skin. This is typical of Nepali favoritism. Take it with a grain of salt. Avoid expensive restaurant momos or small hotel momos as they are likely to be expensive due to the long time it takes to make and cook a momo. Tourist momo’s can run anywhere between 150 to 600 rupees a plate! There’s really no reason or need to be paying over 300 rupees. The momos photographed here are all under 150 rupees a plate. How to make your own momo! There are three key things to make momo. A Steamer. Thin pasty shells which are much easier to buy than make yourself. And, typical momo spice. Without these, it’s not really possible! Steam momos for 10-15 minutes! Garam masala is one of the key ingredients for momo. You can find it at most Nepali or Indian supermarkets or in Ason Chowk. Later on I’ll cover local momos which are a little different to these tourist or mid scale momos. Which are better? The one’s featured here! In China there is something similar, people generally refer to them as 饺子 （jiao zi） even though there are three kind of dumplings (steamed, fried and boiled) and each of them has a specific name which I forgot. My favorite place to eat them are crowded (no touristic) small restaurants (usually about ten small tables and no bathroom) where you can have 15 of them for less than 2 USD. Thanks for the great insight into Tibetan and Chinese dumplings! In a few weeks I’ll be writing up about “local” Nepalese momos. It would be interesting to hear from you about if you think they are closer to Tibetan and Chinese dumplings. I’ll include more photos! What is the little dish in the middle? A dip? Great point! I left that bit out. I’ll have to add it above. Yes it’s a dip. Every momo restaurant has their own style of dip. This one is a light Masala tasting dip. Funny, we just had exactly the same thing in a typical Japanese restaurant. This seems to be something South East Asian countries have in common. I enjoy these fried too. So far momo spotting has led to Nepal, Tibet, China and now Japan. Does your wife think Siomai comes close to momo? The food has a lot in common with Japanese dumplings. Also, I know some with the same recipe only being fried. Interesting. I they certainly look like them. But they look different to local Nepalese momos which I’ll include a little later seperately. Fried momo’s also on the way! Which recipe? Flour,salt,water?One egg or not? I found a recipe for you Giovanna. But you really need some light masala and a steamer to go authentic with them. Stay tuned, I’ll have more on momos in a few weeks! Maybe there’s a Tibetan or Chinese restaurant in your part of Germany? It won’t be the same, but it could come close. Momo fan here. Took a Tibetan cooking class in Dharamsala & learned how to make them. Elle– we probably had them in the same cafe. There’s one cafe which had awesome momo soup and momo platters. I went there a lot within a month’s time.But being a Tibetan town, there were a lot of momos around. Street vendor to cafes and each place had a slightly different flavor.